This article demonstrates how the author of the Book of Proverbs (“The Book of Parables”) parabolically describes people in terms of what psychiatrists used to call “morons,” “imbeciles,” and “idiots.” By going through the passages in the Book of Proverbs that describe their characteristics, it discloses that God lumps them all into the broader category of “fool” simply because they refuse to believe the Truth of The Teaching of Moses. The answer to the first question in this set identifies all of the historical events orchestrated by God that Moses and the Prophets point to as ‘olam. It then explains how the parabolic imagery in those events applies to the Baptism and Crucifixion of Jesus Christ. 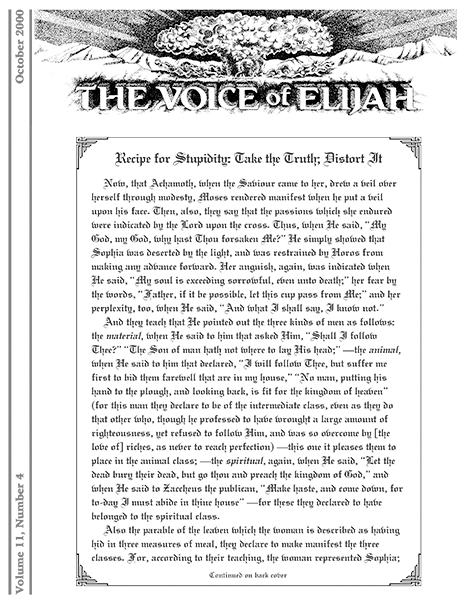 The answer to the second question explains Psalm 139. The final answer explains what Jesus had in mind when He said to the thief, “Today you shall be with Me in Paradise” (Luke 23:43). 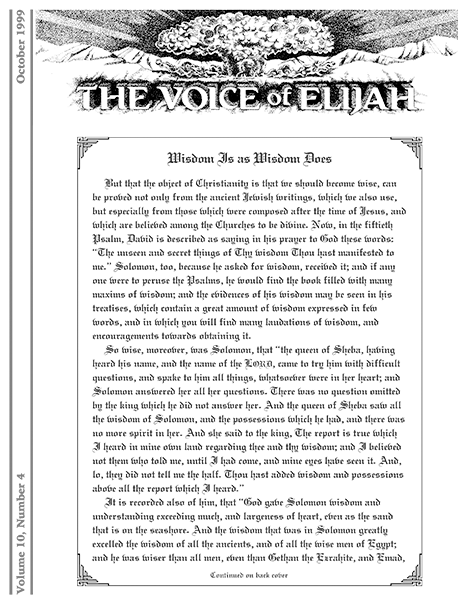 In the articles I have written for The Voice of Elijah® and The Voice of Elijah® Update over the past few years, I have made a point of using incendiary terms like fool, idiot, imbecile, and moron to describe those who stubbornly reject the Truth of The Teaching. My purpose has been to provoke people who strive to be politically correct and give them no good reason to give credence to anything I say. That technique works rather well because we all respond more or less unfavorably to anyone who would dare speak so derogatorily of others. It is just another of those quirks of human nature: Rather than first considering whether or not something is true, we all ignorantly tend to accept or reject things on the basis of how they are said. That is especially true of anything that we deem too dogmatic. It is just more evidence of the stubbornness that Satan, the Master of all Fools, has successfully inculcated into the human psyche. I only mention the mastery that Satan, the Fool, has over all other fools as a segue into what the Prophets say concerning those who stupidly continue to epitomize the absolutely awesome ignorance of their father, the Idiot. That Lamebrain, Satan, had direct knowledge of the Truth, having heard it from God Himself. Yet, because he valued his own thoughts and ideas more than an honest evaluation of what Someone Else had to say—no matter how He said it—he turned away from the Truth he had heard and stubbornly walked off into the darkness he now rules. To put it bluntly, Satan became a fool because he placed no value on a knowledge of the Truth. If you think folks like him are not a dime a dozen today, you are obviously content to live in a reality of his own making. Stay tuned, coming attractions may change your mind. 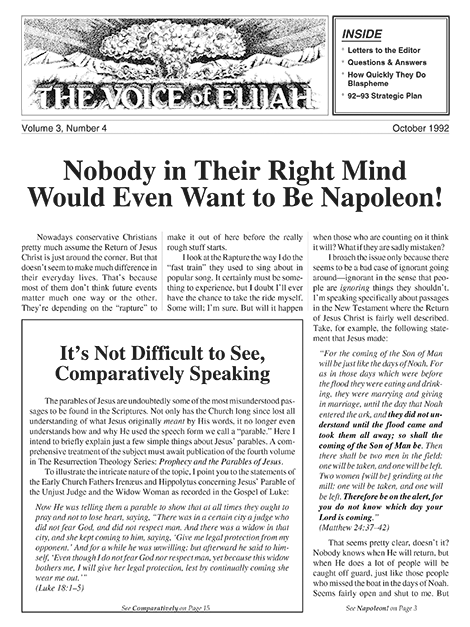 Nobody in Their Right Mind Would Even Want to Be Napoleon! It is generally accepted that a perfectly rational person is one whose state of mind accurately reflects his state of being. The deluded fellow who believes he is Jesus Christ is generally accepted as being insane. Where does that leave all those people today who believe Satan’s lies? They insist everyone—themselves above all—is special to God (their deluded state of mind). Like a totally paranoid individual, they reject the Truth about their wretched spiritual condition (their actual state of being). This article makes the point that sanity, above all else, requires a knowledge of and belief in the Truth rather than a fantasy.